One expert questioned the legality of the tactic. The Macomb County party’s plans to challenge voters who have defaulted on their house payments is likely to disproportionately affect African-Americans who are overwhelmingly Democratic voters. More than 60 percent of all sub-prime loans — the most likely kind of loan to go into default — were made to African-Americans in Michigan, according to a report issued last year by the state’s Department of Labor and Economic Growth. Statewide, the Republican Party is gearing up for a comprehensive voter challenge campaign, according to Denise Graves, party chair for Republicans in Genessee County, which encompasses Flint. The party is creating a spreadsheet of election challenger volunteers and expects to coordinate a training with the regional McCain campaign, Graves said in an interview with Michigan Messenger. Whether the Republicans will challenge voters with foreclosed homes elsewhere in the state is not known. Kelly Harrigan, deputy director of the GOP’s voter programs, confirmed that she is coordinating the group’s “election integrity” program. Harrigan said the effort includes putting in place a legal team, as well as training election challengers. She said the challenges to voters were procedural rather than personal. She referred inquiries about the vote challenge program to communications director Bill Nowling, who promised information but did not return calls. 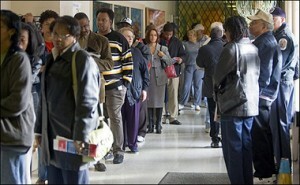 The issue of voter challenges is arising around the country. In Ohio, the Columbus Dispatch, in an July 6 article titled “Foreclosed-on voters using old addresses could snag election,” reported that Doug Preisse, a member of the board of elections in Franklin County and the chair of the local GOP, said he has not ruled out challenging voters before the election. Hebert, the voting-rights lawyer, sees a pattern. Challenging all voters registered to foreclosed homes could disrupt some polling places, especially in the Detroit metropolitan area. According to the real estate Web site RealtyTrac, one in every 176 households in Wayne County, metropolitan Detroit, received a foreclosure filing during the month of July. In Macomb County, the figure was one household in every 285, meaning that 1,834 homeowners received the bad news in just one month. The Macomb County foreclosure rate puts it in the top three percent of all U.S. counties in the number of distressed homeowners. Wayne, Oakland, Macomb, Kent and Genessee counties were — in that order — the counties with the most homeowners facing foreclosure, according to RealtyTrac. As of July, there were more than 62,000 foreclosure filings in the entire state. Joe Rozell, director of elections for Oakland County in suburban Detroit, acknowledged that challenges such as those described by Carabelli are allowed by law but said they have the potential to create long lines and disrupt the voting process. With 890,000 potential voters closely divided between Democratic and Republican, Oakland County is a key swing county of this swing state. “But poll workers are not allowed to ask the reason” for the challenges, Rozell said. In other words, Republican vote challengers are free to use foreclosure lists as a basis for disqualifying otherwise eligible voters. Correction: This article has been amended to reflect the fact that Doug Preisse informed Michigan Messenger that he did not “state or imply” that he had not ruled out challenges “due to foreclosure related address issues,” as originally reported. So the Clinton administrations pressure to force financial firms into making sub-prime loans in decaying areas and to pepole with poor work histories and inadequate income had nothing to do with the foreclosures, right? "More than 60 percent of all sub-prime loans — the most likely kind of loan to go into default — were made to African-Americans in Michigan"
Yes thats a great point, but lets not forget the african american population in ALL of Macomb county is 2.71 percent as of the 2000 census. Dont get me wrong- every vote counts- but as a resident of macomb county I can attest to this demographic. It also doesnt mean that what is being done is right, it just puts your point a little more into perspective. Recently, newspaper headlines have debated the pros and cons of a government mortgage/ foreclosure bailout which of course would be financed at tax payer’s expense. I have read article after article, opinion after opinion, yet I have not seen or heard anyone ask the following question: why should the tax payer’s bailout mortgage foreclosures while it allows governmental entities to foreclose on homes of low-income Americans for back property taxes? Why is it that the government’s concern lies with those persons whose homes are values at approximately $300,000+, while Americans on Social Security and/or Social Security Disability loose their homes while they struggle to make ends meet on an average of $600.00 a month? Could it be that these same politicians who have been elected due to their religious/moral ethics, the politicians who claim to be Christians ignore low-income families because as a general rule, this class of people is not known to vote? I would like to know who amongst your readers will happily pay taxes to better the life style of the upper middle-class and/or the wealthy while the lower middle-class and the country’s poor are continuously allowed to suffer. Should this country truly be looking to bail out those who have made bad decision while they allow those who have found themselves with little choice to suffer? The correction above, while it is welcome and should be accepted in some spirit of good will, forces one to doubt the other "legs" of this story. The carelessness of conflating Doug Preisse's statement with foreclosure challenges forces one to question how accurately Melzer quoted Carabelli. The sensational-ness of the headline calls for a high-burden of evidence to make this a valuable story - if that burden had been met, the story could have been valuable. As is, we're left with a he-said, she-said battle. First, this whole "Republicans are trying to intimidate black or poor voters" is part of a 30-year old "script" we hear in every election. Does that mean the author, Ms. Melzer, is part of a "conspiracy"? No, absolutely not. She's investigating leads based on a script she's been conditioned to accept. Does it mean that Republicans are completely guiltless throughout time and space? No, certainly there have been "incidents" where overactive individual partisans thought they were helping the cause and probably became too zealous (I'd note that those incidents occur on the left too, with different types of "voter fraud," as the historically-infamous political machines of Chicago, LBJ, and even here in Detroit often prove). Here, we know part of Ms. Melzer's "script" came from the July 6 Columbus Dispatch, which she misquotes. That's a human error, as would be asking "leading questions" (Carabelli in his Beckman interview claims), so Carabelli's story that he didn't say it the way Melzer said he did is plausible. I have a hard time believing Melzer would "fabricate" the quote out of whole cloth a la Jayson Blair, but its not a hard step to take to believe that she'd ask a leading question, get an ambiguous answer, and take the notes down wrong in some way. Ms. Melzer interviewed me twice on this subject while I was in Arizona (by phone) during the course of this story, trying to find out if I knew of some "foreclosure list". I told her I was unaware of such a list, although I wasn't in "the loop" for such things, I do deal with voter information regularly and that it struck me as unlikely, and frankly not very valuable if it was the plan, that Republicans would use foreclosure lists. Not valuable because such lists aren't accurate as to whether the voter is in the home, or even if not in the home legally entitled to vote (a recent foreclosure would not necessarily change the residence as Hebert points out). We agreed that "returned mail" would be more valuable and easier to list, although I don't know that the Party uses it since I don't the Republican Party. I spoke of Democrat list broker Mark Grebner, and some of the tricks he's (and accurate points) he's been involved with, and suggested that both sides were likely to use sophisticated mail lists for their purposes in challenges (indeed, Grebner actively sought to disenfranchise petition signers in 2006's Proposal 2, and Drolet's 2008 Dillon recall (on the basis of residency)). She asked if an inefficient tactic might be used just to delay voters and decrease turnout - I disagreed because deploying such a tactic is time and resource consuming to have any meaningful numerical effect, and that it was unlikely to be a good way to change an election outcome (traditional message is just plain more efficient), if it didn't in fact backfire. I told Melzer my experience with the relevant players lead me to disbelieve the foreclosure idea would be used as a tactic. In a second interview, she asked why Carabelli would lie and retract his quote - I told her at that early time (there was no lawsuit by the DNC and the story just broke) I didn't necessarily believe anyone was lying, that I couldn't speak for Carabelli, and that it was possible there was a mis-communication and that she should place herself in the shoes of her interviewee. This perspective was not quoted in the article, and while I understand that to be within reasonable editorial discretion particularly given the length of the article as is, it might have given the article some perspective. Some stories are so good they penetrate through the "script". There's a "smoking gun," or chain of logic that is impenetrable. Here, you have one quote stretched to the conclusion with one of the supporting background quotes being retracted. This story doesn't have either, unless there is some future break that breaks the log-jam of "he-said, she said." Certainly, if proven true this story would be important, but the more sensational the truth, the higher the burden in proving it. If this story proved its case, I'd stand behind the author in a bi-partisan way, but I just don't see it. The truth is likely somewhere in between - I suspect Carabelli answered a question about foreclosures, and it was either leading and he wasn't precise or the answer misunderstood or notated. I doubt Melzer intended to fabricate a quote, but to make this one stick she's needs more. Chetly -- can you tell us right now that you are not receiving any monies from conservative candidates for services that include making them look good? You've left another comment here without disclosing that you, as owner and operator of Zarko Research and Consulting, provide multiple services for conservatives and their political campaigns. You have a vested interest in making a case against progressives, and the mere act of leaving a comment here in thread may be part of your paid services. Our readers have a right to know that they may be reading commercial services provided on behalf of your conservative clients. We are a progressive website; we are not partisans, running a broad spectrum in our philosophies from Green to Libertarian and everything in between, which includes fiscal conservatives/social liberals to social conservatives/fiscal liberals. We often don't agree, and we have to find common ground in our work. We have a perspective colored by this range of philosophies, and it's ultimately progressive. What I want to know is why is this different and unacceptable when mainstream, corporate-owned media outlets actively use their bias as product differentiation. FOX News, for example, is hardly a neutral outlet, and they make no bones about being conservative. They make of point of targeting a conservative audience as part of their marketing strategy. I also want to know why you have such doubts about this one piece of Melzer's work in particular, that you've had to invest more than 800 words in this thread alone; you have not been commenting at this site for quite some time, and it's only now since publication of Melzer's investigative work on "voter foreclosure" that you've returned. Are you investing similar amounts of effort elsewhere in the blogosphere? Or only on issues that impact Republicans in Macomb and Oakland County, Michigan? Rayne, you are absolutely hilarious. I sign my responses with my full name without using any means of obscuring my identity. My identity on the internet is an open book, quickly learned from Google, etc. You know who I am. This is a response area to a blog (or at least on blog software if you don't admit to that title), not a place where I do original investigative publication or work where I'd feel that necessary. It's for feedback to you - you know who I am. The idea that I would identify the nature of my business in every blog post is funny. But I'll entertain you somewhat. I openly admit to running a business focused on "conservative and moderate" clients (when the clients are political), although at least one of my political clients was liberal (Christine Barry, FOIA) and I'm sure some of my business clients are or have been liberal. My comments here are, however, unsolicited and do not have any direct bearing to my business, and indeed, in expressing my belief Ms. Melzer wouldn't wholly "fabricate" the quotes could theoretically damage my business (at least, its not the "Party-line", literally). Regardless, no one is compensating me for commenting here - my primary motive for commenting was that I am actually part of the story in that I was interviewed and had some insight into the story as such. While "designing literature" or building a website may make candidates "look good", I'd hardly call it justification for me to waste time here, particularly when none of my active clients have any direct stake in this story (and by the way, I've never had a client from Macomb County, and don't ever recall meeting Mr. Carabelli, although I'm sure we've crossed paths). My lack of commenting MM over the last many months has more to do with being busy (primarily during Primary season) and the obvious nature of MM's product compared to my interests. You'll note my comments in other parts of blogosphere are quite sporadic and haphazard - similar I'd say to here. When a topic interests me, involves me, or simply floats my boat, I invest similar amounts of time -- but on the whole, including even my own sites (which are a priority), its between a few minutes a day and less than an hour. Here, I was called twice by your reporter - I have a somewhat different motivation than almost all your readers for being involved. I have no problem with you admitting that you are a progressive source. Indeed, that's (part of) what I ask for and hold myself to (just as Frank Beckman's point drives home). But the crux of the contradiction is that you criticize me for being a conservative source, and say that it invalidates a priori the credibility of my **arguments. ** On the flip side, you expect your arguments to be taken seriously when you admit to being "progressively" biased but simultaneously attack others solely for being allegedly conservatively biased. The bottom line has to do with our arguments and their quality - and you make no effort to address the substance of my argument that this story isn't persuasive because 1) it miss-paraphrased a key second-example from Ohio, calling into question the accuracy of the whole article 2) there is no pattern beyond Carabelli, and the "script" of the story is an ongoing "progressive script" where even subconscious bias could have lead to "leading questions," and a misinterpretation somehow of his words. I've posted a well-thought out, moderate interpretation of events, and all I get is you trying to shut-down debate with irrelevant points outside of the merits of my argument. Conservatives and progressive/liberals can actually reasonably debate, but it can only be measured (perhaps by moderates persuaded) without regard to anything but the argument itself. The labels are quite irrelevant. In that sense, its ironic the Republicans are pointing out your progressive biases, but it hoists you on your own petard and is an unfortunate part of any "he-said, she-said" type of battle. 1) This isn't your first internet rodeo; you know that the majority of readers do not run checks on usernames, especially if they believe they may have been spoofed. Just because you sign in here with what you know to be your real name does not mean that our readers do. 2) The problem is not that you are conservative. It's that your comments here may constitute work product, not merely somebody throwing out an opinion, and you regularly fail to disclose your conflict of interest. 3) I note that you did not answer the question as to whether you now or in the past have represented anybody in Oakland County. 4) Based on the estimated 1500 words you've written in this thread, you can hardly say anybody here has shut down debate. We should take bets on how many words you'll use in your next missive here. 5) You want to avoid labels? Here it is, the crux of this entire sitution: Did Carabelli disclose to Melzer the use of foreclosure lists? Did he disclose there was more being done besides the use of foreclosure lists? You've already got Melzer's reporting on this. And you can listen to Carabelli's reply on Frank Beckman's program, just as other readers can. We hope and trust the readers can sort their way through the static that began once the lawyers and PR firms began defensive moves. That includes reading carefully the clarification regarding Priesse's comments. As I've been reading various blogs (without comment until now) the one thing that is painfully apparent is the total absence of objectivity. We all tend to surround ourselves in personal ideologies and point out the "gross" injustices of those who do not think as we. Obama is a terrorist and baby-killer, Bush is a liar and war criminal (and McCain is just like Bush). Every good lie (and every good joke) has SOME truth in it and most of what I read (from both sides of the coin) are lies . This nation is polarized and it is not Bush's, Clinton's, Obama's, or McCain's fault... it is our fault. To take one source and ignore any opposing views is narrow-minded and short-sighted. Democrats read and observe liberal news and Republicans do the same with conservative views. As I read the comments in this thread, I mostly hear hatred and blame. There is some truth in all the points listed. I'm sure there is some truth (maybe a lot of truth) in the article being discussed. What is our individual responsibility to ensure everyone with the right to vote has opportunity to excercise that right? What is our responsibility to ensure those who do not have the right to vote do not cast a vote? That would be a more productive discussion. We can't just start fighting for everyone to vote (regardless of legality) and we can't start fighting for no one to vote. I believe with all my heart we should look for the balance and then excercise our right to vote for others looking for balance. Both parties have good and bad but neither party seems to accept the good in the other and both parties ignore the bad within their group. As (admittedly) difficult as it is for me at times, I'm going to research the possibilities of voter disenfranchisment and voter fraud... and I will go and vote for the person I believe has the best plan. bottom line: these foreclosures would not have happened if our economy was in better shape - thanks to the bush administration. This story is completely false. I have spoken with the Macomb county Republican Committee and they have categorically denied ever making such statements. I would contact Ms. Melzer but this "progressive" media lists no contact number to challenge them. What can be done about this issue and how can it be stopped? It's enough to talk about the issue and make sure they wont try this in other states as well! These people behind this move should be tried in a court of law, convicted and put in prison. This is the most unamerican thing I have ever seen, save the awful efforts they went through in the south after the civil war to stop blacks from voting. I'm a white man 72 years old and I am ashamed of some people in this country for even thinking of something like this. Thankyou God for helping us get this far towards equality, but this takes the cake. When I was in Korea, there were no blacks and whites when we faced an enemy, there were just Americans and we all stuck together. Even a southern boy would have said that, and at the time they were still keeping the blacks segregated, but they fought along side of us. This is sinking. These people have already lose their homes and now they are trying to take away their rights. What kind of country and people have we become. This is the time we need to come together and make a change. Shame on the Republicans! The Democratic Party needs to get together and stop this insanity. That is really low, but not surprising. I think the best strategy to defeat this ugly effort would be to publicize it and encourage anyone likely to be on a foreclosure list to vote early or vote absentee. That will give voters warning, so they aren't taken by surprise, can take lots of documents along to show they still live there, and won't allow the Republicans to slow down the lines for other voters on election day. The local Democratic Party headquarters should also make legal information and knowledgeable supporters available to such voters, in case they are challenged at the early/absentee stage. Is this sinking to a new low....sorry, your house is gone.....sorry, your vote doesn't count....maybe this isn't a NEW low....just another low blow to people without a voice. For crying out loud! How can the Republicans think this is remotely ok to do this? They're the ones constantly talking about living life with a "moral compass." Baloney! What Chutzpa! I hope everybody hears about this one....it'll be President Obama come January, for sure! And hooray to that! the erroneous plans need to be stop. we have to get out there and get more people to vote. The Republicans got away with a very similar strategy in Florida the last two times--voters names could not be found or they were erroneously listed as felons or the polling places closed early. By the time the dust cleared, it was too late; election over! Don't think they can't get away with this or would never try such a travesty of justice. They have and will again. And the ironic thing is they get away with it and the middle and lower classes keep cheering them on as if they were being represented! Unbelievable! Will they be barring the folks in Galveston who lost their homes to Ike from voting next? Oh, probably not, that's a RED state! What an insult to the working folks who lost their homes, but still pay to bail out the banks and Wall Street. It's like the Poll Tax. America is going backwards. That is a good point you bring up, one will have to wait and see. I get that we have to have voting rules, but this is very hard to wrap my head around. Its an admission that as a party, they are willing to do what is necessary to win at all costs. Shameful. What they are saying is make sure all your informaiton on your voters registration is correct. I noticed my birthdate was incorrect, DVM corrected the matter immediately. Incorrect informaiton on voters registration will disqualify your vote. Please check and update all information on your voters registration. This is an outrage!!! A down right outrage!!! Blocking voting is a terrible nasty cheating thing of the Republicans to do! They did it last election in several states for many made up or false reasons. I can't believe I live in this country, slowly we are turning into what we never wanted in the first place which is controlling and fascist and its all because the Republican party wants to take away our constitutional rights!!! They would want the Wealthy Fat Cats at the top to get even wealthier while the majority of Americans, working class people get stupider, lose all of their rights, and have nothing left but the military and god. There should be protesting and riots in the streets. France's citizens always prove their point and the government is afraid of them because over there it's a true democracy where the people have a choice which is what it's supposed to be like over here. If those citizens don't get what they need then they revolt. This whole thing upsets and enrages me and makes Canada look more and more inviting to me by the minute. Foreclosure proceedings DO NOT necessitate the loss of a home. You can have proceedings begin and STILL live in and even keep your house. This is ridiculous. A lot of people have been late on their mortgages lately and have caught up. Happens all of the time. No one has batted an eye in the past. This is really sick and this is supposed to be the moral party. These are the most twisted morals I have ever witnessed. What kind of crap is this?? So what is going to be done about all of those that get evicted from an apartment or any form of rental property??? This is discrimination!! The GOP can't possibly be that ignorant!!!! what happened to our America? Palin for VP she is not qualified, McCain is one of the Keating 5. The connections are all there another election is getting frittered away and worse yet stolen. as an Alaskan I am greatly concerned to hear about our fellow US citizens of Michigan being robbed of their voices. The media here in AK is attempting to stifle the many of us who reject our Governor's place on the Republican ticket, yet the media here says nothing. I am ready to scream, I am ready to protest, I am ready to stand up with my brothers and sisters in Michigan and say enough is enough! All this political underhandedness is making me sick. The fact remains that some of our politicians are heartless. If you have to go to these measures to stop the democratic vote, something is dreadfully wrong. If something like this happens, all I can say is God does not like ugly. Carabelli will have to face the wrongs of his ways. You may think that you can get away with treating people bad, but it comes back on you even harder. It's bad enough that some of these people may lose their homes in the long run, but to be turned away from the polls is outrageous. I hope he can sleep at night, and that he don't one day have to face foreclosure himself. What right do he have to invade peoples privacy? Our government has really gotten out of control. I'll believe this is a group of concerned impartial citizens when they also get a list of those with more than one piece of property and challange them. Isn't it likely that people in that group could register under both residences, or all 10 of them? Seems like something to be concerned about to me. Until that time it just looks like a tactic to disenfranchise folks. Heywood sounds like a member of the Michigan Messenger, but anyway, an address on a list that is generate from foreclosure filings and not actual foreclosures does not prove that a person does not reside at the address in question as stated in the article. There are laws that prevent individuals and organizations from blocking someone from voting based on non-factual information and those that break these laws run the risk of being in viloation of a few civil rights laws. Me, I would have that person blocking me from voting without absolute, undenialbe proof, arrested on the spot. A larger picture, and should be look at by civil rights groups immediately, involves going after Trott & Trott and the local GOP for poll tampering if at all possible. "(1) A registered elector who has removed from 1 election precinct of a township, city, or village to another election precinct of the same township, city, or village and has not recorded the removal with the local clerk shall execute a transfer of registration request, ..."
-essentially, you have to process the change of address. (2) "....It is not necessary for the elector to change his or her registration to reflect the change in order to be eligible to vote." Maybe you can't get into the details here, but I was wondering if your reporter recorded the interview? This action on the part of the Republican party, using the law to supress citizen participation, is indicative of the mentality of a once proud political party. Challenges based on foreclosure details, besides being mean spirited, narrow minded and vindictive is flat wrong, factually and lawfully. Circulating the propaganda that your vote won't count if the address on your voter registration shows up on a "foreclosed property" list will cause some people to skip voting. I am, have always been, but may not continue to be, a Republican for over 50 years, and I am disgusted with this group of henchmen that call themselves Republicans. the subtitle is obviously an attempt to increase racial divsion. isn't one of the requirements to vote is to be able to prove residency in the district? how can the voter rolls be accurate without proof of residency? this isn't suppression of voters right but fowollowing the law and common sense. to reader1722 suspended habaes corpus? where? in gitmo? those are POWs and not subject to constitunal protection (they aren't even afforded geneva convention rights since they aren't uniformed soldiers of any recognized nation). what went on a abu graib isn't considered torture when compared to cutting off heads, hiding weapons in places of worship and schools, fighting behind civilians. you need to grow up and quit being such a bleeding heart, this is a war and we are figiting for our lives. demonstrators that are caged have no right to interfer with a convention. their rights to free speech end when they begin to disrupt someone elses right to free speech. they can go rent a hall or whatever and talk about anything they want. Um the war was declared, approved by congress and santioned by the U.N., where were you? clinton did go to war in kosovo without authorization, where was the outrage? consficating guns in new orleans was totally wrong and something the city did on its own and not the feds. They violate the 1st Amendment by opening mail, caging demonstrators and banning books like "America Deceived" from Amazon, Wikipedia and Facebook. "They violate the 1st Amendment by opening mail"
"They violate the 2nd Amendment by confiscating guns during Katrina." That was the action of local authorities in LA, Democrats! "They violate the 4th Amendment by conducting warrant-less wiretaps." "They violate the 5th and 6th Amendment by suspending habeas corpus." Hasn't happened! You have no evidence in spite of what you say. "They violate the 8th Amendment by torturing at Gitmo." Never happened! Too many people moving in and out to keep it quiet. Have you even seen the facilities? "They violate the entire Constitution by starting illegal wars without declaration." Congress gave the Executive Branch the authority to engage up to 200,000 troops without action by congress. I thought this was good? Bill Clinton would undertsnad the issue in Michigan, “Its the economy stupid”. Michigan’s economic problems begin with the Democratic Michigan Governor. Over the last 6 years Governor Granholm’s “Big Government” & “Tax and Spend” polices have destroyed Michigan’s economy. Granholm and Obama are tied at the hip. Their Campaign Promises concerning Taxes are identical. Ask Michigan’s residents about taxes Granholm has proved that Obama’s Policies are wrong for America. Contrast Michigan with Ohio. The Democratic Governor of Ohio, Ted Strickland has pursued policies to reduce the tax burden and shrink the size of Government. Governor Strickland, and the Ohio Legislature, have taken action to reduce Individual and Business Taxes. Ohio is on the road to recovery while Michigan continues in a downward spiral. The election isn’t about Parties - It is about Policies. You need to to do a little homework, brush up on your Michigan history. Jennifer Granholm took office while saddled with $2 BILLION in budget deficits left behind by the Engler administration; Engler had managed in his 3 terms in office to take a budget surplus and piss it away, instead of putting it in the bank for the days ahead when the automotive industry wasn't doing well. Since Granholm first took office, the automotive industry has continued to flounder, unable to compete with offshore competitors due to rapidly rising health care costs and commodity costs. Since the state remained locked in a macabre death spiral with the auto industry, and since it was unable to afford to build a way out, the deficits have continued to thwart any chance for improvement in Michigan's economic climate. The deficit represents debts that the people of the state of Michigan incurred; they have to pay them down. There's no way around it. You may see this as increased taxes, but paying down debts worked under the Clinton administration when it was saddled with Reagan/Bush deficits. Just as one can obtain better credit ratings by paying all debts on time and on schedule, so can Michigan improve its situation if it takes care of obligations. Michiganders need to stop listening to shallow hucksters like Engler who promise to "give them back their money" when in truth he meant he wasn't going to pay the bills, and the tab would eventually come due. Lastly, comparing Ohio to Michigan is rather ineffective if Ohio's business hasn't been as tightly invested in a single industry which collapsed as the automotive industry has in Michigan. Strickland's lucky he hasn't had to deal with that level of challenge. This story is a complete fabrication. The Messenger is making up quotes in order to cause a political stunt. The Detroit Free press has already debunked this article and the quote. Your newspaper is pathetic, and I imagine what's left of the paper's credibility will be destroyed when this saga is over. If it is a complete fabrication, I would expect to hear of a libel/defamation suit filed against it. Since I have not, I believe there is enough truth in the article to warrant attention. In fact we see the opposite - Obama's camp is filing a suit against the GOP over this "debunked" article. If they have enough evidence to file a suit, that tells me there is something to the allegations. That being said, I do not trust any politician, regardless of party affiliation. The best I can do is look up their voting records and vote for whichever candidate most closely lines up with what I believe on the issues. Michigan Messenger stands behind the reporting of Eartha Jane Melzer and this story. Please point to where the Detroit Free Press debunked this article; to the best of my knowledge they have only noted the inconsistencies between what our reporter was told and what the Macomb County Republican Party chair said in rebuttal. If you check across the different media outlets that have featured the same party chair, there are many inconsistencies in his statements from outlet to outlet. What we have is a dilemma. Voting was originally meant to be a privilege extended only to property owners. Well that was no more since the invention of mortgages. Renters are voters. So this tactic, adopted by heartless fascists is just that - a tactic, and a savage one at that. On the other hand it is reasonable to verify residency in a given governmental municipality or locale (via absentee ballot). This tactic is mean-spirited and needs to be challenged and defeated. Proof of residency and age is all that needs to be verified. Get rid of the Democrat and Republican duopoly and this problem will go away. Interesting concept. Personally, I think it's less about the parties than it is about power and money. Start by taking the money out of politics and the motivation to suppress voters is undermined. If the Republican voting stance on people displaced due to mortgage foreclosures is taken to its logical conclusion, then those people (from mostly red states) that have been displaced due to Hurricane Ike who now have no house in which to reside would also have to be included in that stance. I am not condoning or endorsing such a decree, just pointing out what the Republicans themselves are purporting. You're misinterpreting Michigan election laws. Either you're Michiganders who are ignorant of them or you're from out-of-state and don't understand them is irrelevant. Read the election laws and then come back. Michigan election laws place priority on where people are REGISTERED, not property titles. It doesn't matter if your home is foreclosed, not foreclosed, foreclosed and you still live there or you don't. If you're registered to vote there, the respective precinct is where you vote. Michigan law places an importance when someone moves on where they were LAST REGISTERED. If you move and haven't registered at your new address, you're eligible to vote at your last residence. This, of course, puts the onus on the voter to register in the correct place. If you vote in one place and live in another, you are robbing yourself of the right to vote for the people who directly represent you. This usage of foreclosure lists as a means to prevent people from voting is simply voter suppression by the GOP. Plain and simple. When your house is foreclosed, many simply don't know what they're going to do. Am I going to move? Negotiate with my lender? As such, by the time the election comes, even if you are in foreclosure you haven't re-registered if you have moved. Someone needs to remind the GOP that this tactic won't stand up in court. And I fail to see if someone has moved that they can vote in two places. You can only register in one place and vote in the place. So-called "voter fraud" is a myth concocted by the Republicans in order to justify passing voter-suppressing legislation like voter ID laws. I thought McCain was a reformer. He is continuing the same Bush Policies.Taking away citizens indiviual liberties. Please email this article to the Obama Campaign. They could use this material for a campaign aid against John McCain. This really ties him to Bush and show him benefiting from those who are hurting. Use everything the republican preceive as a weakness and use it to our strength. We have to quit whinning and get to work. The republicans are not use to us fighjting back. If they refuse to let us vote shut down the voting polls. Bring the news stations, riot! The Law firm is also breaching client confidentiality. There should be a call to boycott this law firm. Hit the greedy republicans where it hurts. The pocket book. How is this a Bush issue? Denial is not just a river in Africa. Because you refuse to admit the truth does not obviate the truth. The Iraq war is the perfect example of the failure of "Bush Doctrine" of preemptive war. Each and every excuse given for going to war was proven to be false and it has cost the US over 4,000 lives, over 2 trillion dollars, the respect and trust of the world and the opportunity to turn all of the good will of 9-11 into a world changing event. John McCain with all of his military experience, with all of his training, with all of his political experince could have stopped this war. Single handedly. He could have said "NO" and the congress would have gone with him but for all of his military experience, for all of his training, for all of his "foreign relations" experience, he blew the call. Absolutely blew it. He does not deserve the chance to blow it again. "So it appears that the WMD argument to spank Sadam was valid." Funny, the Iraq Study Group disagrees with you. "Regarding Iraq, the Commission concluded that the Intelligence Community was "dead wrong" in almost all of its pre-war judgments about Iraq's weapons of mass destruction and that this constituted a major intelligence failure. The Commission's report described in great detail the systemic analytical, collection, and dissemination flaws that led to the Community's erroneous assessments about Iraq's alleged WMD programs. Chief among these flaws were failures by certain agencies to gather all relevant information and analyze fully information on purported centrifuge tubes, insufficient vetting of key sources, particularly the source "Curveball," and somewhat overheated presentation of data to policymakers"
In other words, Bush lied, servicemen died now McCain wants those same lies to make him president. I'd call that more of the same. "(C)ost the US over 4,000 lives"
Under no circumstances can this be deemed a policy failure. Heck people in the country do not really care about military deaths." That is a typical Bushist line. The military serve. They promise to give their lives, if need be in the defense of their country. To dishonor that sacrifice by using under false pretenses, using lies and deceit, to achieve purely political goals stains the memory of every serviceman killed or wounded in Bush' Iraqi adventure. Military people are expected to die. That means the commander in chief carries a special responsiblity to exercise wisdom and caution with their sacrifice. Bush didn't, McCain won't. failure. Are you standing in line to get a loaf of bread? Is you daily needs rationed? More to the point where is the money going?" Gee, let's see. 2 trillion dollars, Let's see. $7,000 for every man, woman, and child in the US. Let's see, where is it going? In the toilet, that's where it went. Not to our defensee. not toward achiving energy independence, not to rebuilding our infrastructure. Just in the toilet. And McCain wants more of the same. Respect and trust are by their nature very amorphous." No, respect and trust are why we're supposed to vote for John McCain aren't they? Isn't that what his leadership is supposed to be all about? We respect his leadership and trust his jusgement? Money, power, and governments can be lost. Respect, honor and dignity can only be given away. George Bush with his dishonesty, with his boorishness, with his arrogance, with his ignorance, gave away our honor, took away our respect, and threw away our dignity. John McCain was there, helping, every step of the way. "Single handedly. He could have said "NO"
Bit arrogant don't you think? " No, I don't think. There were two men in the congress who could have done this. John Warner and John McCain such was the respect they carried inside and outside congress and across party lines. If either of them had gone to the floor of the Senate and said, "NO" Bush' AUF would have evaporated. But, they didn't. Take your pick, McCain put his party before his country or he's too incompetent to be president. There is no middle ground. President is not earned because you've been in a POW camp or spent the last quarter century pandering to lobbyists in DC. Dumping your first wife for a younger, prettier, richer model who can help your political ambitions is not the stuff of presidents. Crashing 4 navy jets is not the judgement of presidents. Pulling strings with federal regulators to stop an investigation of a banker with whom your wife is involved in several questionable real estate deals is not the stuff of presidents. Failure to recognize the real threats facing this nation and placing the desires of your party over the needs of your nation is not the stuff of presidents but, it is the stuff of McCain. Turning down high six figure jobs so you can work to help people make their lives better, working to convince people they can be better, inspriring people to work for a better America, inspring people to believe in themselves and their nation, that is the stiff of presidents and that is the stuff of Obama. I saw that all your comments were removed, I don't know why, but maybe you could trying telling the truth, maybe the administrator of the site doesn't want you to spread your lies. You really need to get more sources of information than Fox News and your own blog. Rather than take a quote from a third party, an inspiring quote I might add, and try to use it as "proof" against Obama, try actually reading his books. Try educating yourself. I will not change your mind. You are the type of voter the Bush-Mccain people depend on. Afraid. Ignorant. Angry. Hateful. They prey on your weaknesses, your fears, to get you to vote against your own self interest and in theirs. I was a McCain supporter in 2000. In 2002 when he climbed on Bush's war bandwagon he lost my vote. In 2008 when the "Straight Talk Express" turned into the "Can't Lie Fast Enough Express", when he not only embraced Karl Rove's campaign tactics but the people who executed them against him in 2000, as he and Palin rail against earmarks while Alaska and Arizona split nearly 3/4 billion dollars in earmarks, while he talks about financial reforms while Phil Graham, the architect of the deregulation that made it all possible is his top economic advisor. He proved my misgivings correct. There are no good reasons to vote for McCain. You can vote for him because you're a Republican and no matter how stupid the choice is you will vote Republican. You can vote for him because you're a victim of his campaign tactics. But, on the issues, the only sane vote is for Obama. You're kidding right? No really, you gotta be joking. Is your source to "prove" Bush' justification for his stupid war? And I suppose you think Fox news really is "Fair and Balanced"? I have rational discussions with rational people. The proof of Bush-McCain's failures are there for those who care to open their eyes and look. September 2002 to January 2003 Bush declares on many occassions Iraq to be an "Imminent" threat and yet, for six months did nothing. If he really thought Iraq was a threat he would have attacked immediately. He knew there was no threat and the only threat to his plans were the UN Weapons Inspectors. October 2004 debate. The moderator asked Bush "given what we know now, ..." would he still have invaded Iraq. Bush said yes. He did not try to correct the moderator. Just said yes, even given perfect knowledge he would still have invaded. This, whether you admit it or not, is an acknowledgement that the reasons given for the invasion were false. I knew this in 2002, Russ Fiengold knew this in 2002, Ron Paul knew it in 2002. McCain either didn't know it or chose, like you, to make believe. In either case, when the time came to lead, McCain failed. He does not deserve the chance to fail again. sonny, sonny, sonny. That uranium was no secret stash. The IAEC and Weapons Inspectors had that stuff under lock and key since 1997. That's why this "news story" upon which you hang your hat is nothing more than a footnote. Even Bush didn't claim this "find" justified his war. Why? Because, sonny, it is so easily disproven, except to the fooled. Did you read the AP article? Tuwaitha and an adjacent research facility were well known for decades as the centerpiece of Saddams nuclear efforts. A child molester "justifes his crime by saying "the child wanted me to". A thief rationalizes his crime by saying "they didn't need it anyway." Don't try to rationalize Bush's crime in Iraq or McCain's complicity in it. "Found buried and preserved - mobile chemical labsFound"
"Sarin artillery shellsFound Mustard Gas Artillery"
In every instance the "proof" claimed by the Bushists turned out to be more lies. None of the "justifications" you present, even if they were true and even if Bush had knowledge of them before the war, meet the criteria laid out by Bush for his decision to go to war and justify his deception of the American people. Remember "Imminent Threat", "Clear and Present Danger"
None of what you present meet that test, while most of if, like 20 year old artillery shells rusted out and buried in the desert, were both unkown at the time of the invasion and presented no danger at all except to the poor unfortunates who found them, that would be US soldiers. Even using what Bush did not know to justify his actions, even in the face of the undeniable fact that what he claimed to know was lies, STILL fails to meet any reasoned test of "imminent threat" or "clear and present danger." The story you referenced as your ULTIMATE proof was true. Your interpretation on the lies you and the rest of the Bushists add are what is false. It took about 90 seconds to disprove your lie. But, as always, these lies are not aimed at me, a person willing to look and understand and research. These lies are aimed at the ignorant, at those who are afraid, at the lazy. If you are not a liar you are then ignorant, afraid, or lazy. There is no middle ground. they need to know right this instant." Tell that to the parents of the 4100 US service personnel who've died in Bush's war. I understand. I've understood from day 1 that this war was never about WMD. This war was never about terrorists. This war was never about Iraqi freedom. This war was always about one thing and one thing only. Projecting American military power in the oil producing regions of the Middle East. The single object of Bush's war in Iraq was the overthrowing of the legitimate government of Iraq and the insertion of a puppet government obedient to current US desires. The objective was faulty, the execution flawed, and the goals will never be met. Occam's Razor. To accept yours, and Bush's explanation I have to believe that all of the intelligence was just wrong, that all of the nations advising the US of the folly of the war were just wrong, that all of the reasons given for the war were true, despite all of the information to the contrary. Sorry, the pieces of your puzzle do not fit properly and the simplest answer is almost always the correct answer. The simplest answer? Bush lied and McCain helped. "That is little more than a low blow. You know full well what kinds of things should not be made available to the public just because you can." If you are going to kill an American serviceman he, and his family, have the right to know that the cause is just. That the cause is honorable. That the justifications are true. None of those things can be said of Bush' s war. "The Brits, Italians, French, and Russians, to name a few, all were of the opinion that WMD programs in Iraq were viable and extent." And yet none of them supported Bush's war. Actions speak louder than words. OBVIOUSLY, the French, Germans, Russians, countries with an active presence did not consider Iraq a threat. "Just which nations were those, prior to 2003?" Germany, France, Russia, to name a few. fact. That sounds a bit like hindsight (always 20/20)"
Yet another Bushist lie. The Weapons Inspectors found no justification for the Bush allegations. Joe Wilson spoke to the lie about purchasing uranium. Yes, there was intel supporting Bush' s position. There was at least as much intel opposing his position. If you're going to kill a US Serviceman, be right because he won't get another chance. In 2002 Saddam released a report to the UN detailing the absence of WMD and weapons programs. What? Was he honest and believable in 2000 but a liar in 2002? The CIA's own evaluation said that Iraq was unlikely to use WMD unless they were attacked. Was Bush trying to get Iraq to use WMD? No, he didn't believe they existed. The lies he told were for people like you. "That reconstitution is why I believe those "weather stations" were hidden." It is a fact that John McCain had access to all of that information and either failed to realize the truth or was complicent in the lies. In either case, McCain does not deserve another chance to fail his nation. The GOP likes to think that only black are on foreclosure lists. I know a LOT of white families who have been booted out of their homes this year, too. Some of which are Republicans tried and true. Wonders if they, too, will be turned away from the polls. This will be followed up on and heavily scrutinized. Watch your backsides neocon fluffers, and NOT just from the likes of Larry Craig.